The York Peppermint Patty candy is one of the most distinctive candy flavors, defined mostly by the fresh peppermint flavor covered in dark chocolate. 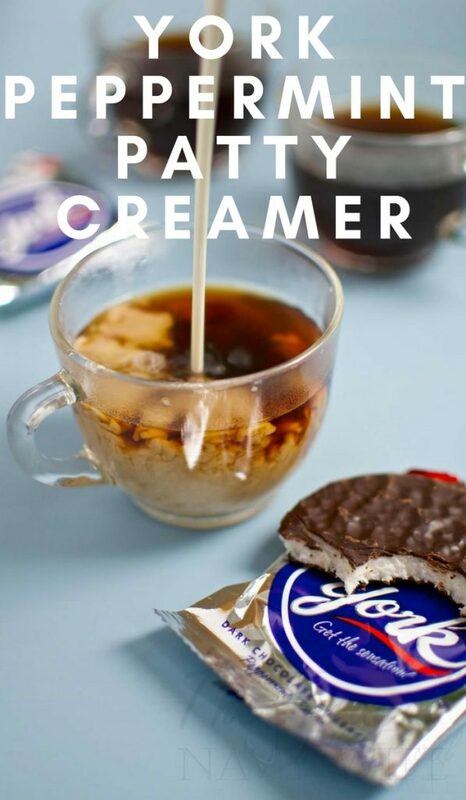 This is one of my favorite flavors, not just around the holidays but all year long so you will randomly find this York Peppermint Patty Creamer in my fridge in December, May, July, and even October! Yeah, I'm weird like that. If you couldn't tell that I love peppermint patties then you haven't seen my Peppermint Patty Cookie Recipe I also am in love with this Copycat Starbucks Peppermint White Hot Chocolate Recipe. Oh. My. Yum. This recipe uses peppermint extract and dark chocolate syrup to mimic the flavor. If you can’t find dark chocolate syrup near you (I linked to it on Amazon below), substitute regular chocolate syrup for similar results. Mix the heavy cream, chocolate syrup, and peppermint extract in a sauce pot and warm over low heat, stirring occasionally. When warmed, remove the cream mixture from the heat and stir in the sweetened condensed milk. Refrigerate to cool, then add as needed to warm or iced coffee. Stir the creamer before adding to coffee to mix the flavors. Is there something I can use in place of the sweetened condensed milk, I don’t like it and I don’t use it at all, I don’t even buy it, I have never bought it.